Here is part of my collection, there are total 78 cars in this box. 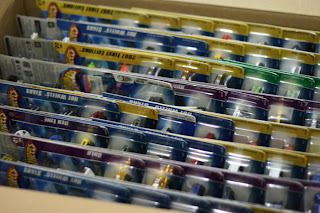 Like many other collectors, I keep cars carded, I have very little cars have opened to play (or you can say display). For adult like me don't really "play" with these die cast cars anymore. Some of the forumers trade cars over forum and eBay. I have yet traded any cars online, but I did sold a few cars to my friends with my cost price. My cars all are opened. I love touching and taking picture them... :) Good luck Bro!